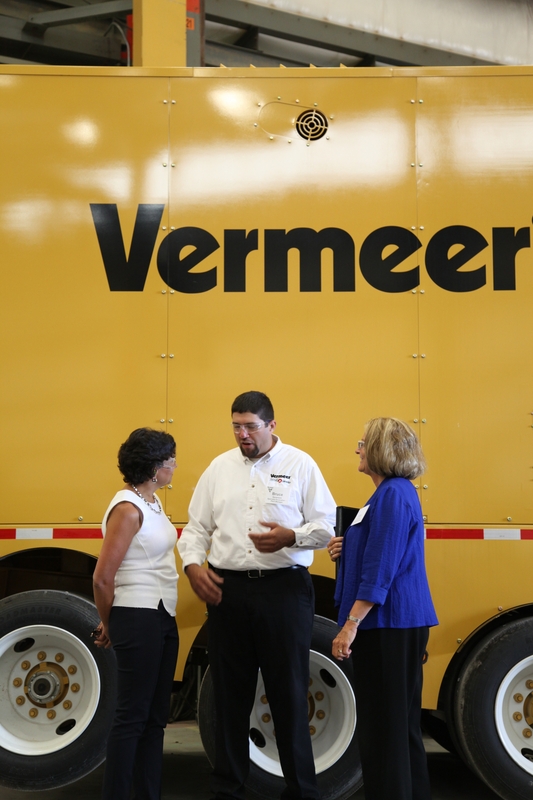 Today, Secretary Pritzker toured the Vermeer Corporation in Pella, Iowa. Her second stop in Iowa, the visit, which is part of her nationwide listening tour, gave her an opportunity to learn how the 65-year-old manufacturing company has innovated to stay successful and competitive in the 21st century economy. The Vermeer Corporation, one of the largest employers in Pella, is a family-owned and managed U.S. manufacturer that serves customers with forage, specialty excavation, environmental and underground equipment products to more efficiently and responsibly work farms and ranches, improve infrastructure and manage natural resources. The company’s founder, Gary Vermeer, is credited with inventing agricultural equipment now in widespread use around the world. Secretary Pritzker first toured Vermeer’s facilities with company CEO Mary Andriga and U.S. Senator Tom Harkin, where she saw several of the company’s machines in action. The secretary saw a reclaimer, a machine used to purify water in the process of drilling to install underground utilities, as well as a leveler, which is used in surface mining. She also saw Vermeer's Parts and Distribution Center, which ships out 800 packages a day. Vermeer has 65,000 active part numbers in inventory, and ships 30 percent of its parts internationally. She also learned about the company’s efforts in exporting – Vermeer's products are distributed through a network of more than 500 dealerships around the globe. Thanks in part to exports, the company’s annual sales are estimated at approximately $1 billion. In fact, Vermeer earned a Presidential “E-Star” Award for exports in 1998, recognition American entities can receive for making a significant contribution to the expansion of U.S. exports. Following the tour, Secretary Pritzker led a roundtable discussion with Vermeer executives and other local leaders from the Des Moines and Pella, Iowa business community. They talked about what the government is doing well in supporting manufacturers and where there is room for improvement, and the secretary heard from the business leaders what more the Commerce Department can do to continue helping American manufacturers.